Slow Roll is a free and inclusive Monday night bike ride that is open to all ages and skill levels. 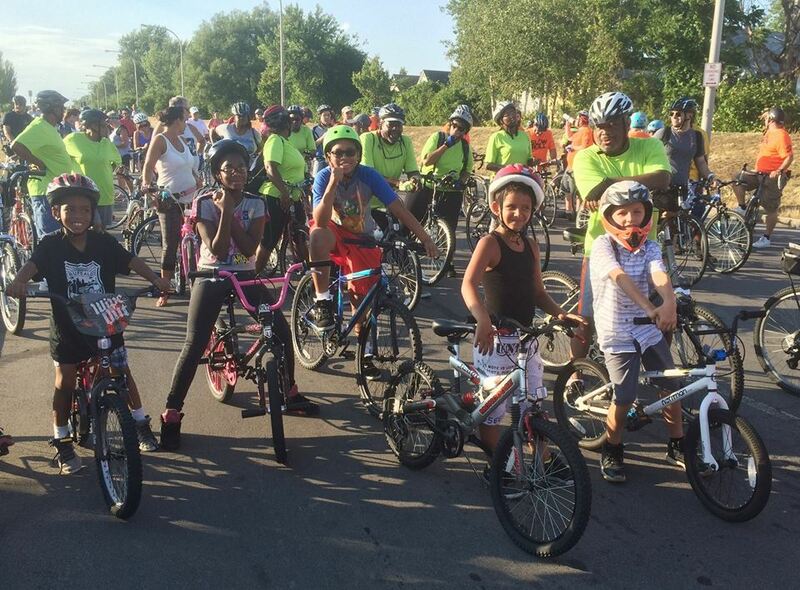 Part of a global network of community rides originally started in Detroit, Slow Roll Buffalo has become one of the largest community bike rides in the country, presented by Independent Health and a program of GObike Buffalo. GObike Buffalo is a bicycle and pedestrian advocacy organization that works with the city to improve the quality and safety of our city streets to create a complete street city. How long and fast are the rides? 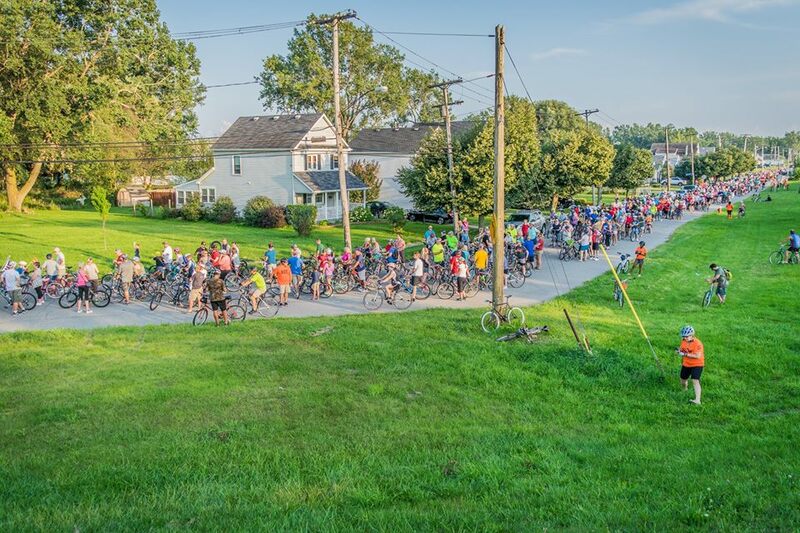 Guided by a volunteer squad of more than 100 trained cyclists, each Slow Roll is around 10 miles round-trip, with at least two stops aka “mass-ups” to get everyone back together while learning from community stakeholders in the immediate area about current events and issues. All bikes are welcome except for gas-guzzlers and training wheels – participants range in age from 0-96. Every ride returns for an after-party with food, drinks, music and fellowship. The front of the ride sets a slow pace of 8-10MPH for juniors and joyriders; the paces gets faster toward the back of the pack, as the mass of cyclists stretches out and catches up like an accordion. So, it’s more than just a bike ride? Yes! It’s a community event to connect people across borders – the bike is just the vehicle for an inclusive and ongoing conversation about our city. When is the next Slow Roll and is it really FREE? Where is the next meeting place or when is the next ride? There are many places to get information from us, the homepage will have the next upcoming ride and the schedule will have all rides within the next couple months. You can also join our Facebook Group where many updates are given, you can also find information on Instagram or Twitter via the hashtag #slowrollBUF to get updated ride info. Slow Roll Buffalo is free and always will be! One-time annual registration onsite or online here. What do I need to do to bring? Just a working bike and a good attitude, although it is best to come prepared with a helmet, extra tube, lights and water. In New York State, all bicyclists under the age of 14 years old are required to wear safety certified bicycle helmets when they are operators or passengers on bicycles (Sec. 1238(5)). Slow Roll Buffalo urges those who drive to our bicycling event to avoid parking on residential streets. In consideration of residents, this request is the primary purpose for offering weekly parking tips in our news section. Where can I find the route for the next ride? Slow Roll Buffalo posts the upcoming Monday’s major streets and neighborhoods along each upcoming route in our news section, social media, and to local media, while conducting many forms of advance notification along each route including daily outreach rides; road signs; flyers; calls and emails to block clubs, businesses and community organizations; posts to the NextDoor app and more. Slow Roll is not a race with a constantly-controlled route; it’s a community event for which bikes are the vehicle, therefore we stress that participants join at the start/end location rather than create chaos by coming in and out at whichever intersection is most convenient to them. We stop the ride for buses and emergency vehicles, and occasionally to relieve traffic. How can I volunteer with Slow Roll? Why does Slow Roll have a police motorcade? Slow Roll Buffalo originally operated without a police motorcade, and perfectly maintained safety in the process. 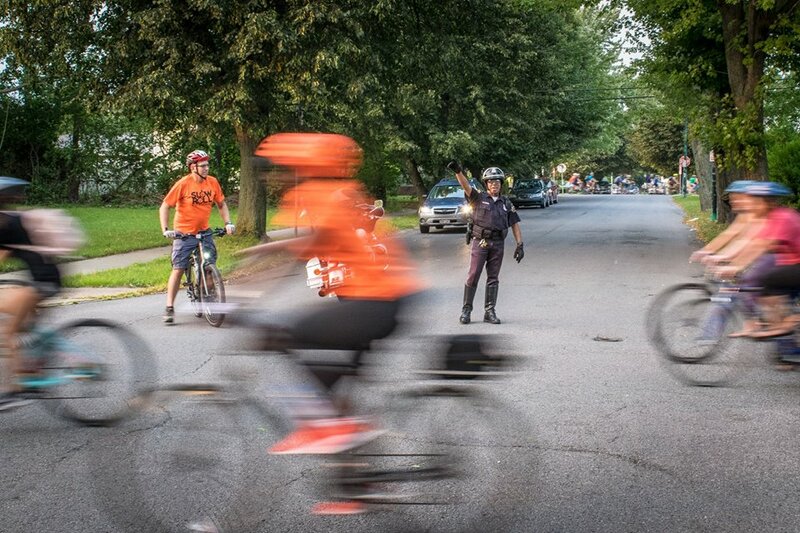 As our ridership was growing from a couple hundred people on our first ride to the thousands we now average, The City of Buffalo urged us to file for a motorcade permit to help maintain safety. We cooperate with the city in the spirit of community-wide collaboration. Isn’t Slow Roll just a poverty tour or tool for outsiders scouting for properties? 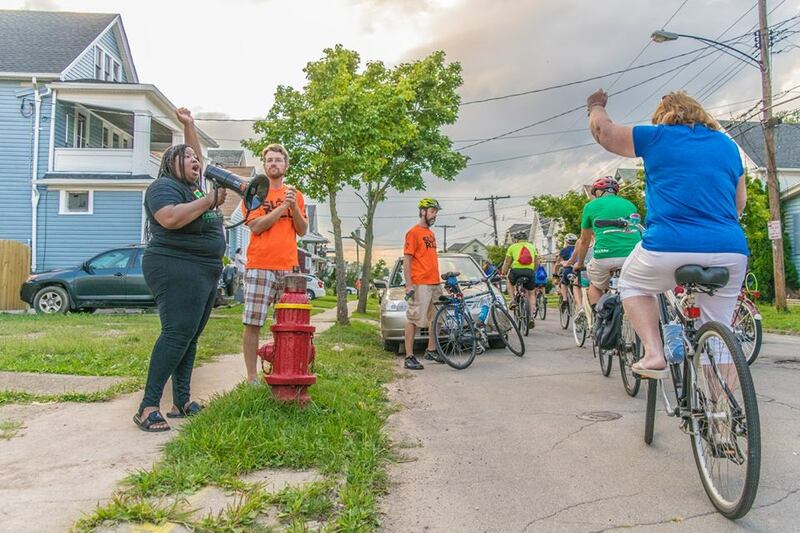 With Buffalo being America’s third-poorest and sixth-most segregated city yet rapidly gentrifying, we understand it’s possible for people to participate in Slow Roll with unjust intentions – this is a downside of being free and open to all, which again, we will remain. We believe in the power of gathering in person and by bike to connect communities and support local economy. Slow Roll has always been about more than just riding bikes – it’s a vehicle for connection, albeit an inherently confrontational one as we take over the road for 90 minutes a week. We realize that confronting underlying social issues that affect our neighbors and neighborhoods makes some uncomfortable, and we feel such acknowledgement and discomfort is a step toward understanding and connecting. Some might choose to cover their ears, or worse, stop riding with us or dismiss us as part of the problem before even participating; we’re always eager to meet with anyone interested in a constructive conversation about serving the greater good through Slow Roll – please feel free to email us here, or even better, get on your bike and ride with us. How can I get involved beyond just riding? 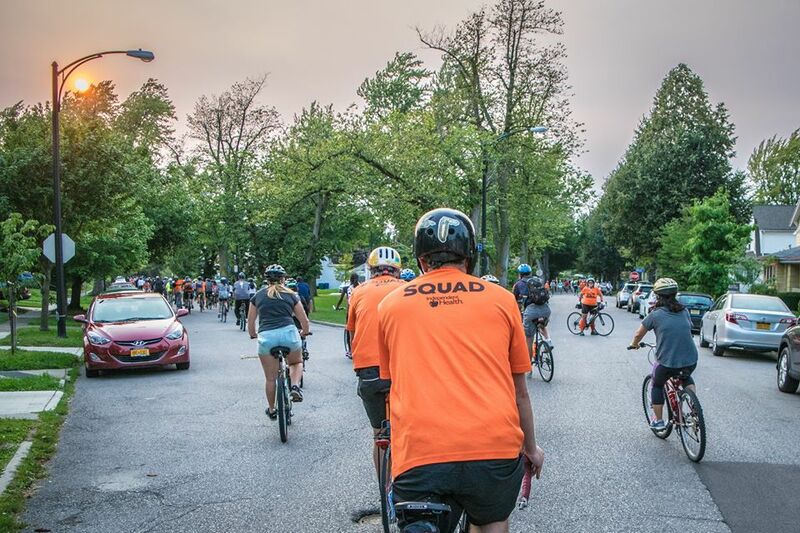 There are countless ways to contribute to Slow Roll Buffalo – apply to join our volunteer squad; donate to help keep our rides free; email us to collaborate with your block club, business or community organization. Slow Roll is and will always be open to everyone! How do I start my own Slow Roll? Slow Roll is trademarked by the founders in Detroit – Slow Rolls in other cities such as Buffalo, Cleveland and Chicago were founded with their invitation. 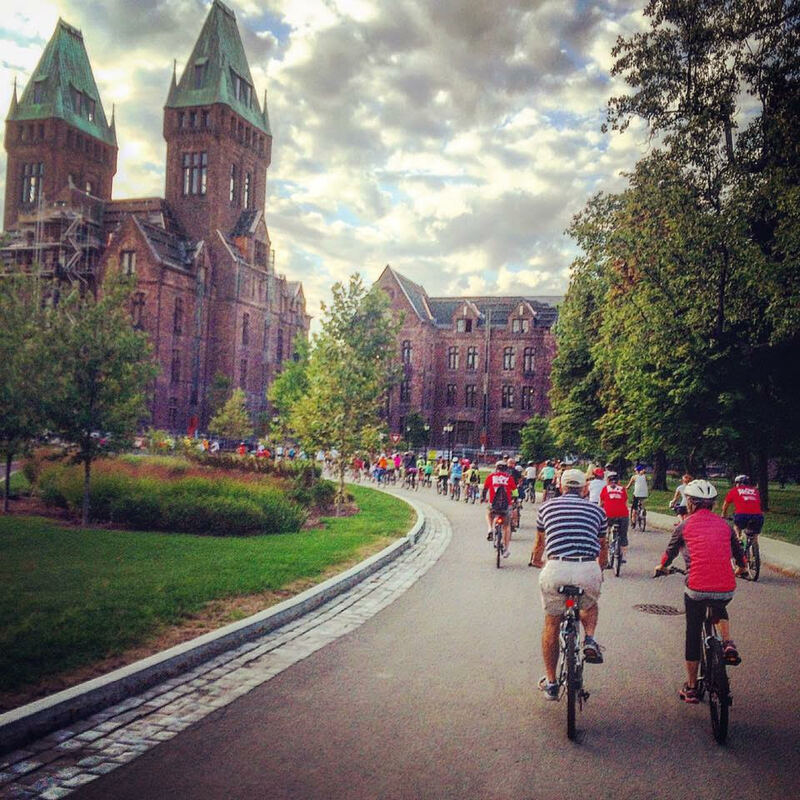 Slow Roll Buffalo organizes many rides outside of the city – Friday Pedal Parties, Saturday Bike Stampedes and more – all inquiries welcome by email. Learn more about the worldwide Slow Roll movement at www.slowroll.bike.